Your pets are the cutest, and of course you want photos of them to post online or just have around the house! However, whether they stay still or bounce around, pets are a tricky subject for photography. 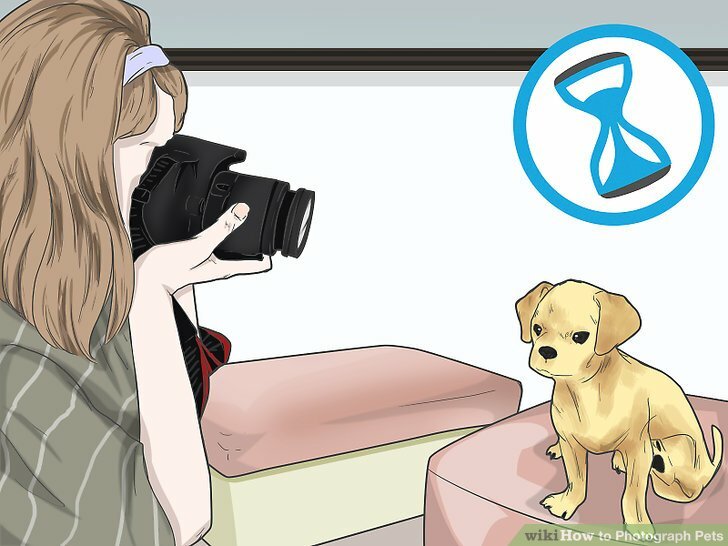 You have to work with the pet to get it to look at the camera, and you have to be quick when you're taking photos! Hold the camera out to the animal for a good sniff. Anytime an animal sees something new, it's going to be curious, especially cats. 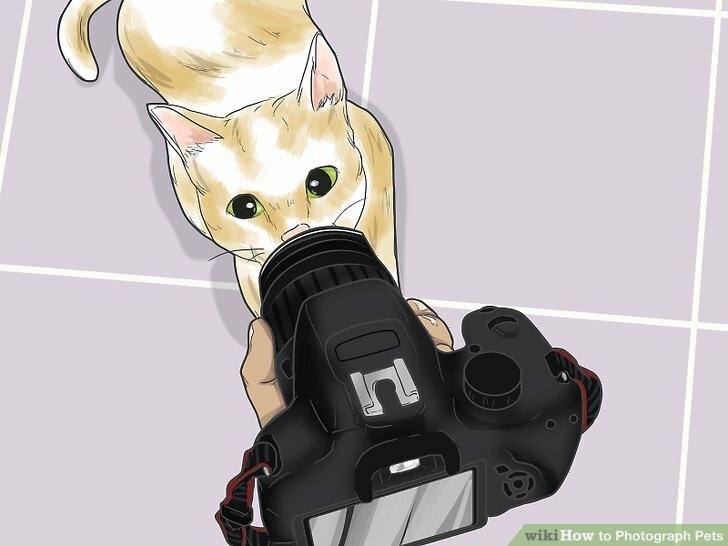 Let the animal take a moment to give the camera a good sniff all over, so it will be less likely to do so in the middle of your photo shoot. If you're not photographing your own pet, let the animal give you a good sniff, as well, so they are more comfortable in the session. Get them used to the flash and shutter sound. Sometimes, the flash will freeze an animal in place for a second, which can be good if you're trying to get a still shot. 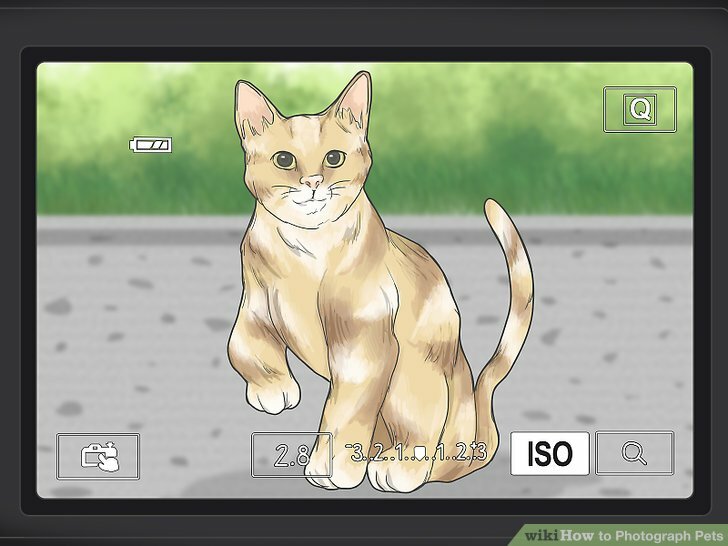 However, both the shutter sound and flash can distract the animal enough to ruin the shot, so take a few shots just so they can get used to that part of the camera. Try shooting a couple of shots towards the ceiling so the animal can hear the shutter sound and see the flash. Give your pet a minute to explore a new area. If you go outside or you take your pet to a new area, it is going to want to explore. Give it a few minutes to look around first! That way, it won't be as distracted when you're ready to take the pictures. If your pet is on a leash, walk it slowly around the area, letting it sniff as you go. If you're in a confined space with a small animal, give it a chance to walk around by itself for a minute. Go outside if you can. Natural light is great for any photography, and pet photography is no exception. If it's especially bright, pick a shaded area where you'll get ambient light for your pictures. Try the hour just after sunrise or the one just before sunset. These hours, called the "golden hours," have the best light. Avoid the harsh light of midday. Of course, you won't be able to take some pets outdoors. In that case, try to get your pet in an area with as much natural light as you can. Open blinds and curtains to let in the light! If natural light isn't an option, try using a detached flash. 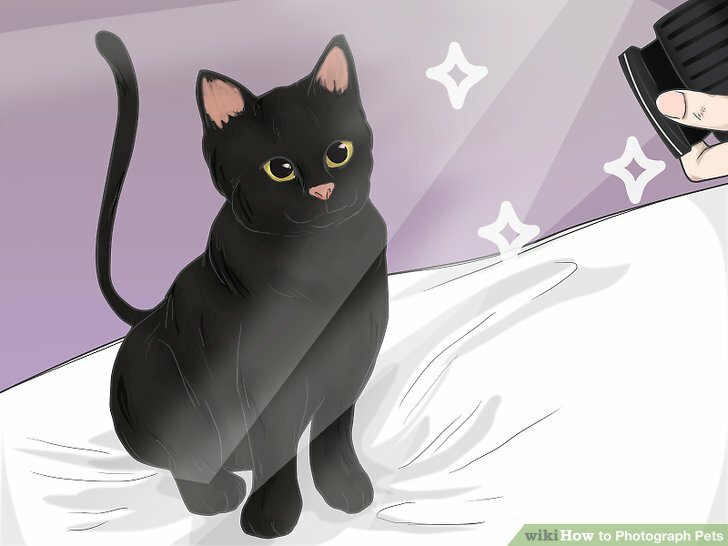 Point it up at the ceiling, and it will reflect back down on your pet to create perfect lighting. Pick a background that's not too busy. Aim for mostly solid colors in the background, instead of patterns and other people. For instance, grass or even a solid color piece of furniture work well in the background. If the background is too busy, your pet won't stand out as much as you'd like. Try to pick a background that makes your pet stand out. 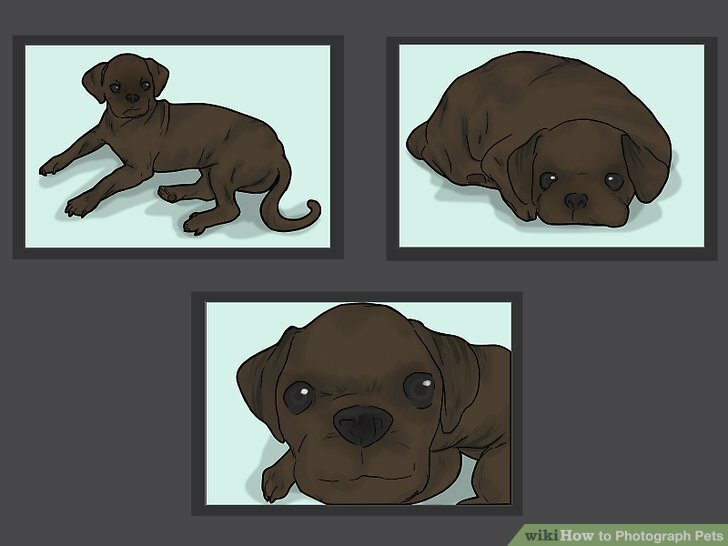 For instance, pick a bright color for a black cat, or a dark color for a blonde dog. Target the pet's face. Most of your pet's personality will show up in its face, so make it prominent in the pictures. If you're manually focusing the picture, use the eyes as your target! 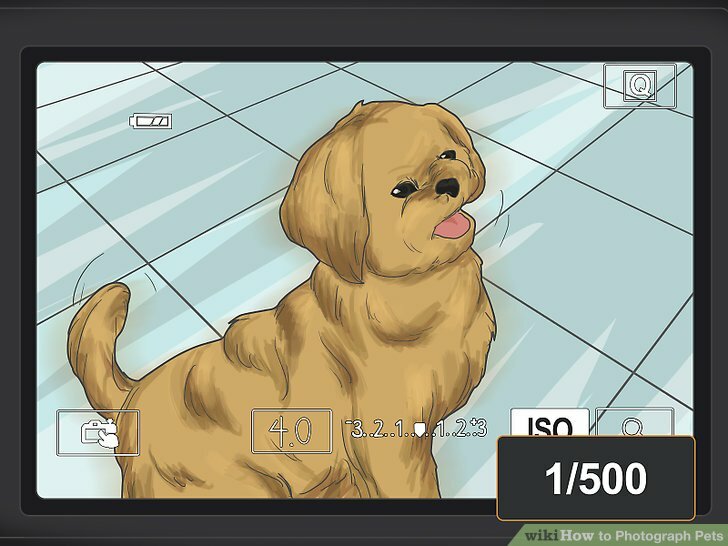 Your pet's personality shows up in their face, so try to capture that! Work on getting a photo of your pet's expressive eyes or goofy grin. Make your pet the whole picture. 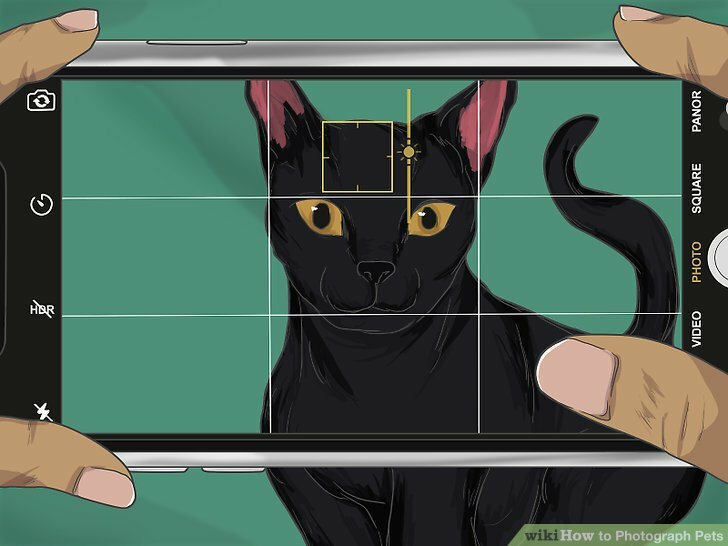 Get up close to your pet, so that it takes up the whole photo. That way, your pet is the focus, and not some interesting thing in the background. It helps to get down on your pet's level if you can. Lay down on the floor or sit down. As a bonus, your pet will probably wander over to see what's going on. If you need to, you can crop the photo later to cut out the extra space. Wait for the perfect shots. A treat can entice a pet to look your way, but it may not. However, eventually, most pets will look at you and the camera. Just be patient and wait your pet out. While you're waiting, have your shot already set up so that when they look at you, you're ready to take the shot. Include your pet's personality. Whether your animal is goofy, lazy, playful, or stubborn, try to make that a part of the photo. If you're not photographing your own pet, ask the owner about the animal's personality quirks. For instance, if your animal tends to be lazy, try to capture a photo of them sleeping. If your pet can do a special trick, show that off! Try different angles and shots. Pets, like human subjects, look different from different angles and framing them in a variety of ways can bring a variety of perspectives to your shots. In your photo shoot, take some tightly cropped facial shots (even focusing in on a single features like the eyes, nose, or ears) but also make sure you take shots that show off your more of your pet's body. Working on different angles may give you an unexpectedly good shot you never would have gotten if you hadn't moved around some. Work in short increments to keep your pet interested. Think of your pet as a toddler, and you'll have a good idea of how long you can keep its attention span. By taking breaks and only shooting a couple of photos at a time, you'll have a happier, more engaged pet for your photos. Set an alarm for a couple of minutes if you keep forgetting to take breaks. 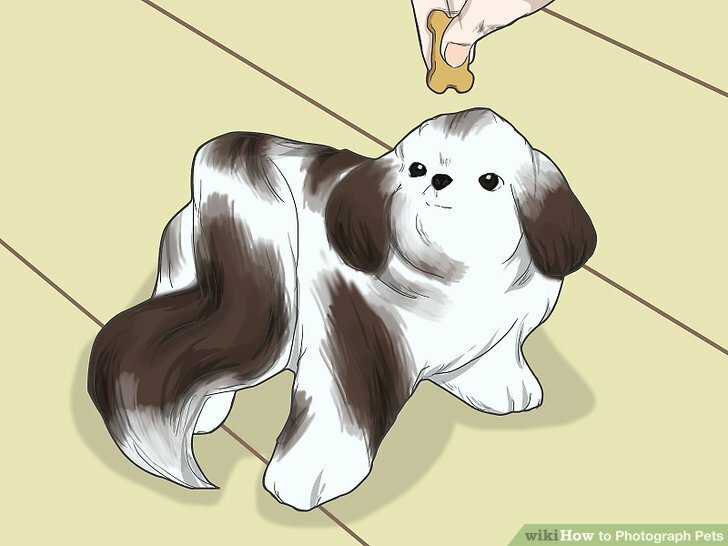 Bribe your pet with treats. Most animals love treats, so now is the time to break out your pet's favorite one. Split the treats up into small bites, as you may need to bribe your animal quite a few times. Try asking someone to hold a treat in their hand near the camera. Make sure the pet knows they have it, and then have the person hide it away. This trick usually evokes good expressions from the animal, especially dogs. Ask your pet to play with you using one of its favorite toys. 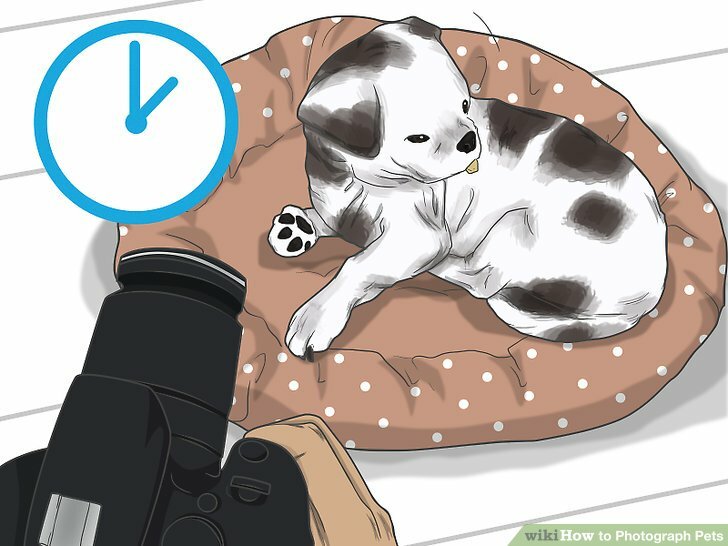 A playful pet will make for good photos, and using a toy will help keep your pet nearby. Grab the toy, and play with your pet like you normally would. 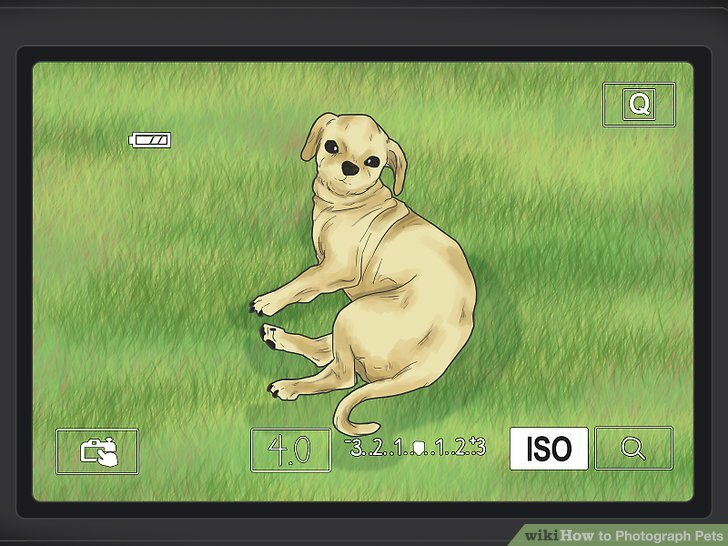 If you have another person nearby, it might be easier if they use the toy to play with the pet while you snap pictures. Tug-of-war toys work great for dogs, and string-type toys work well for cats, as you can entice them to come over. 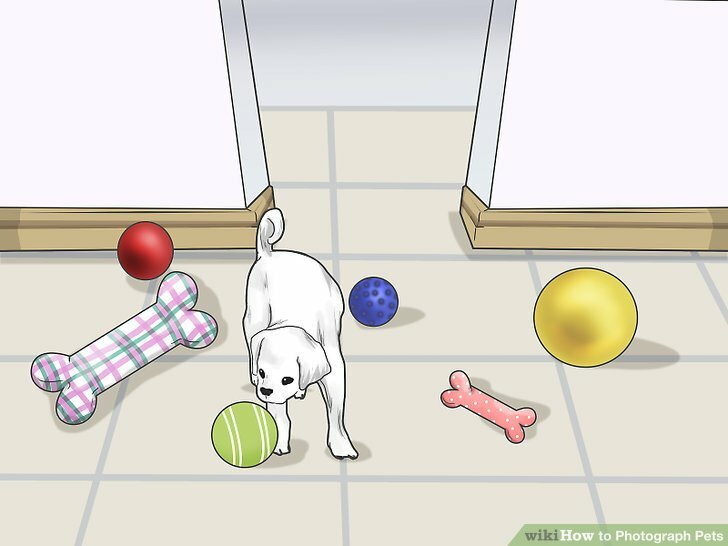 Any toy that keeps your pet mostly in the same place should be fine. Balls don't work as well, unless someone is throwing a ball in your direction. Otherwise, the animal will be running away from you. 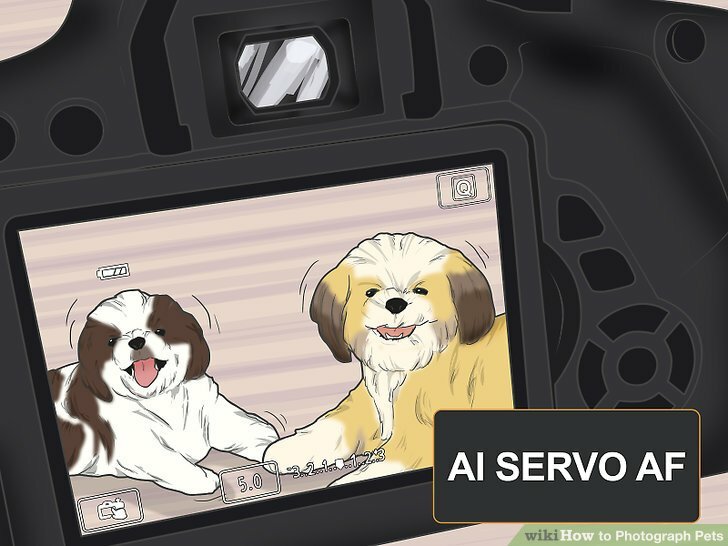 Use the appropriate voice for the type of pet you're photographing. For a dog, be very, very cheerful. Dogs love upbeat voices, especially when you're telling the dog what a good boy or girl it is! Other pets may do better with calm, almost cooing voices. You know what your pet likes to hear! Use the pet names you have for it, using your happy voice. For instance, try a cheerful but calm voice when working with cats. For birds, be very cheerful, but not so loud you scare them. Whistles may help, too! If it's not your pet, get the owner to talk to the pet instead, as they may have better luck than you. Surprise your pet so it looks your way. Of course, you don't want to scare your pet, but something new and exciting can make it want to see what's going on. For instance, you could have a person pop out from behind you or use a squeaky toy to make a noise. You could also try unique noises, such as finger drumming, tongue-clicking, scratching, and whistling. Increase your shutter speed to capture your pet's joyful movements. Most pets are not going to sit perfectly still for you to take a photo! With an increased shutter speed, you're less likely to end up with blurred photos due to your pet's movement. Try setting your shutter speed at 1/500 to begin with. Brighten up the photo with dark pets. 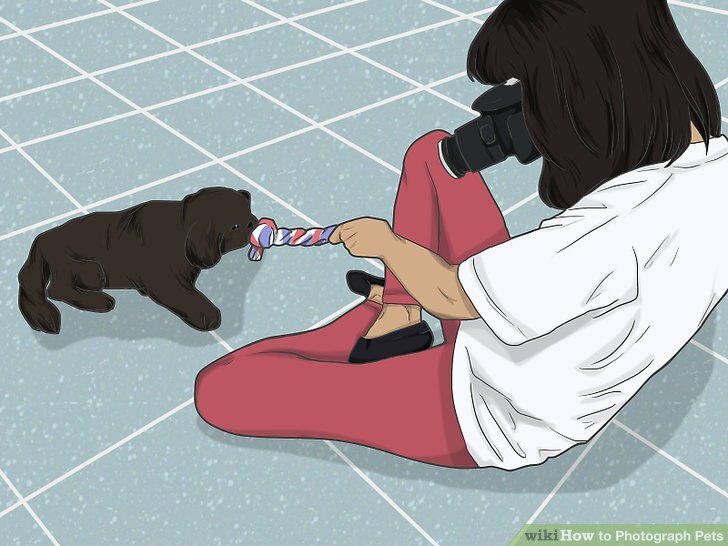 You may find it difficult to take pictures of pets that have black fur, including dogs and cats. You lose some of the detail in all that darkness. One way to help combat that problem is to increase the exposure, so the picture is brighter. On most iPhones, you can increase the brightness by tapping on your pet's face in the picture to focus on it, then move the sun icon up when it appears on the screen. 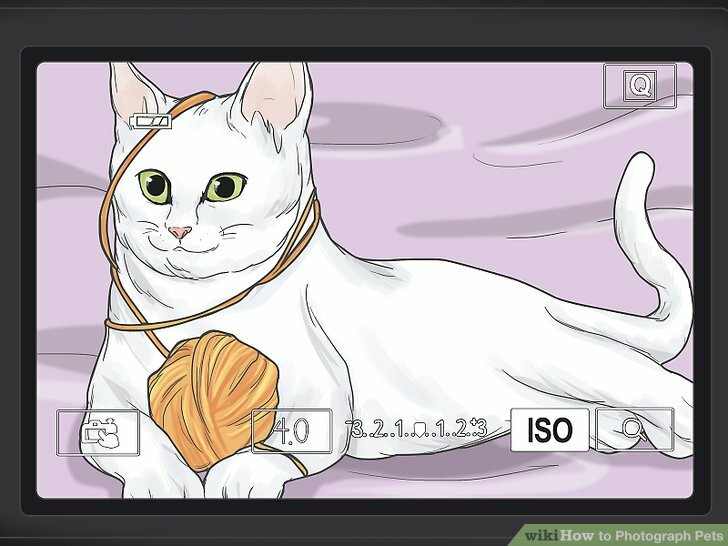 Adjust it until the picture is bright enough to capture your pet's face in all its glorious detail. On an Android phone, it's easiest to adjust the brightness after you take the photo with photo editing software. Use the widest aperture you can for a detailed face shot. 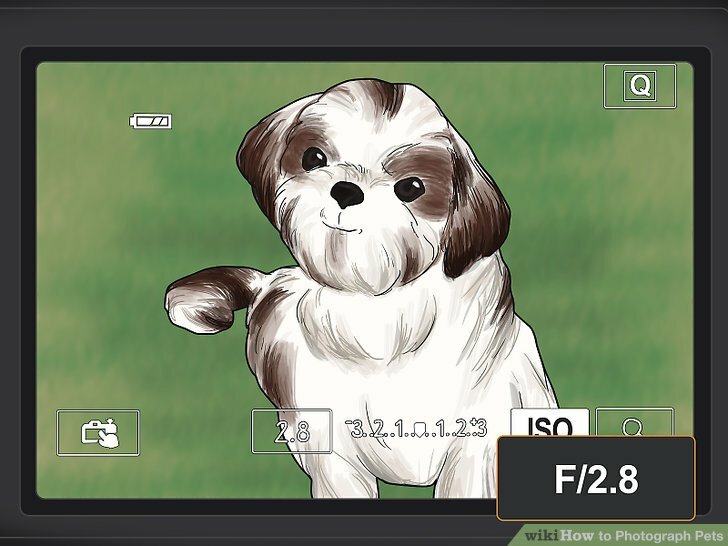 Pick the lowest f-stop number for your aperture, which will be the widest setting. 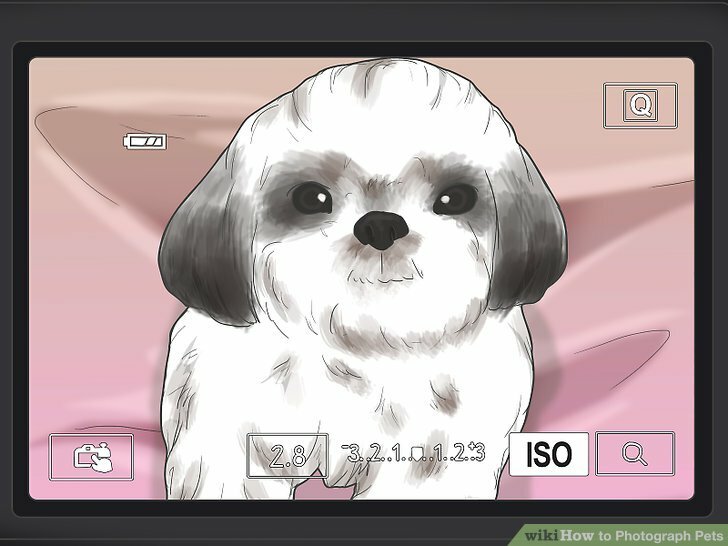 That will bring your pet's face into focus while blurring the background. If you can, also use a wide-angle lens to go with the wide aperture. 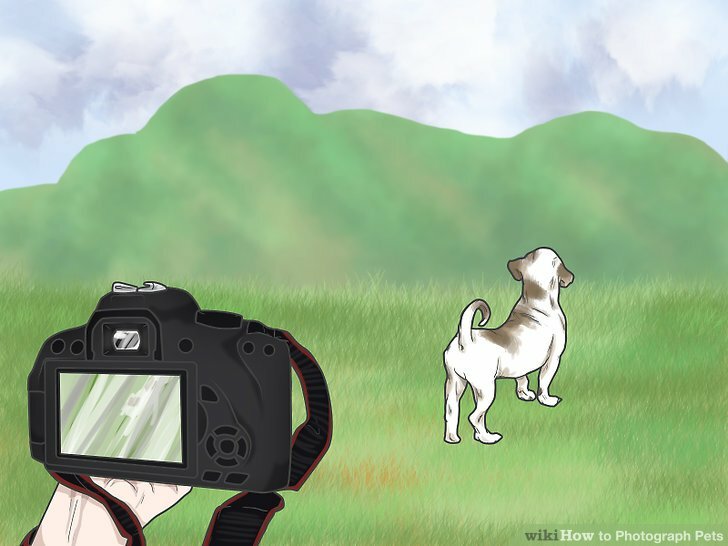 When using a wide aperture, get close to your pet and have them at least a few steps from the background behind them. Put your camera on continuous focus mode. An easy way to achieve this effect with a more expensive camera is to just hold down the shutter halfway. You can also try using the multiple shot mode instead. Lose your tripod. 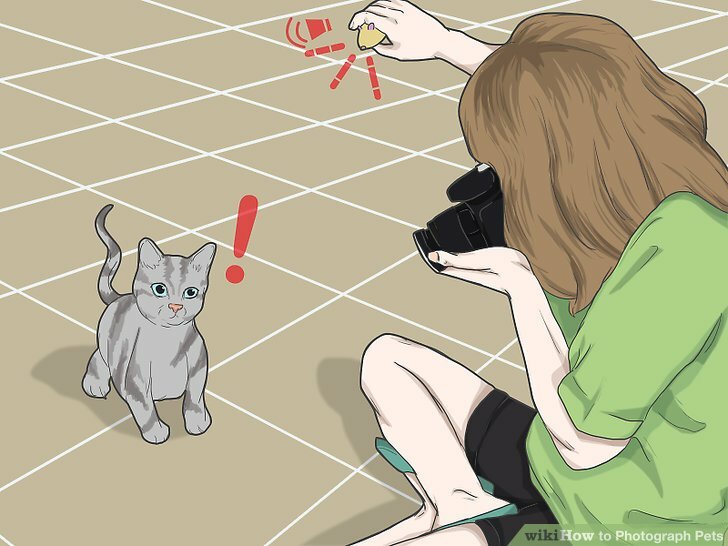 Pets are moving targets, and tripods are almost never necessary for shorter lenses in good light. Any animal can get aggressive, especially in an unfamiliar setting or with strange people. Watch for signs of aggression, such as raised fur or feathers, angry noises, posturing, and teeth-baring.